NASA’s venerable Voyager 1 and 2 spacecraft made landmark explorations of the giant planets from 1979 to 1989. New Horizons is the next deep-space probe after the Voyagers, accomplishing the first exploration of Pluto and the Kuiper Belt beyond—our solar system’s third zone. Credit: NASA. A role of all NASA mission principal investigators is to communicate with the public. I typically give 20 to 30 public New Horizons talks per year, and a question I used to get a lot is whether Voyager could have explored Pluto. 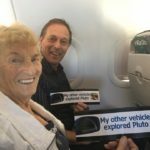 I addressed that really interesting question in this column in June 2014, shortly before our Pluto encounter began — have a look! Now people often ask why the Voyagers didn’t explore the Kuiper Belt, since both Voyager 1 and 2 clearly transited this region after passing the giant planets. That’s a really good question with a number of facets, so I thought I’d address it in this PI Perspective. Our New Horizons extended mission to explore the Kuiper Belt and KBOs runs to mid-2021, when the spacecraft will be at a distance of 50 AU. This mission consists of three primary scientific investigations: studying the ionized plasma and dust environment of the Kuiper Belt with our charged-particle and dust sensors, studying numerous KBOs in the distance with our Long Range Reconnaissance Imager (LORRI), and exploring one ancient KBO (2014 MU69) in a close flyby. Voyager carried many spectacular instruments through the Kuiper Belt, including imagers, spectrometers, magnetometers and charged-particle detectors. Those instruments have contributed a lot to our understanding of the Sun’s heliosphere and the Kuiper Belt plasma environment, even though the Kuiper Belt wasn’t discovered until 1992, when Voyager 1 was almost all the way across the region and Voyager 2 was deep within it. 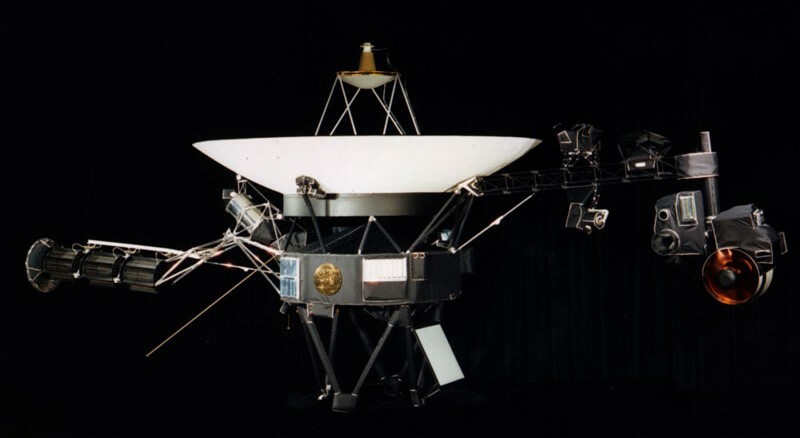 So even though the Voyager team didn’t know their spacecraft was in the Kuiper Belt until 1992, the Voyagers themselves collected a lot of data about the region. 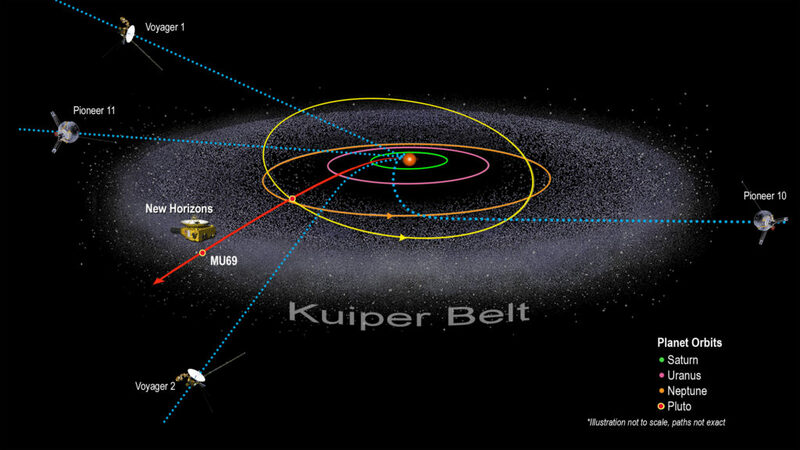 Now, New Horizons is transiting the region with more advanced charged particle spectrometers and a dust detector, making new and more sensitive studies of this aspect of the Kuiper Belt’s environment. Regarding the images we’re taking of KBOs our spacecraft passes in the distance, however, Voyager’s imagers would have not been able to do what New Horizons can—such as search for KBO satellites, or determine KBO rotation periods and shapes. Why not? First, with very few known KBOs at the time, and certainly no small ones known close to Voyager’s trajectory, it would have been impossible to put together a Kuiper Belt target observing list. But even had the team been able to somehow craft such a list, Voyager’s cameras used older-technology Vidicon detectors instead of the charge-coupled devices (CCDs) that LORRI uses (and are found in most digital cameras). As a result, Voyager’s imagers were not anywhere near as sensitive as those aboard New Horizons, and they could not have detected faint KBOs like the telescopic LORRI can. But, perhaps most important is the question: could Voyager have flown by a small KBO as New Horizons will do this December and January? Again, regrettably, the answer is no, for a number of reasons. First, even once the Kuiper Belt had been detected in 1992, the Hubble Space Telescope (the only telescope capable of finding such distant flyby targets, even today) hadn’t been repaired to properly focus light. That repair didn’t occur until December 1993. By then, Voyager 1 was exiting the Kuiper Belt near 55 AU, and Voyager 2 was near 42 AU. But even after its repair, the Hubble wasn’t sensitive enough to detect KBOs as small and common as MU69, so there would have been no way to find a flyby target—that capability only came in 2009, when a more advanced and sensitive wide-field camera was placed aboard the Hubble during a servicing mission. And even if those limitations weren’t the case, it might have been hard to find a KBO along the Voyagers’ paths. That’s because both Voyagers 1 and 2 traveled far out of the plane of the solar system, on which the heart of the Kuiper Belt resides. Unlike New Horizons, which is traveling directly through the densest region of the Kuiper Belt, the Voyagers were literally a billion or more miles above (Voyager 1) or below (Voyager 2) most of the KBO population; they were closer to the fringes of the population where there are fewer flyby candidates. Of course, had the Kuiper Belt been known in the 1980s, the Voyagers could have been targeted to fly through its heart, but that would have adversely affected the targeting of and scientific return from their final flybys at Saturn and Neptune, respectively, something I doubt the science teams would have favored because their prime objectives were to study the giant planets and their satellites. It’s too bad, because their cameras and spectrometers and other instruments could have made very nice observations of a flyby target had they been able to find one. But alas, there’s wrinkle to that too: Voyager’s cameras also weren’t sensitive enough to navigate to a close flyby the way New Horizons can, snapping pictures to home in on MU69 even from distances of over 100 million miles (or 160 million kilometers), so it would have been very difficult to target a close flyby using Voyager. In sum, a Voyager KBO flyby was simply not in the cards, given the lack of knowledge of the Kuiper Belt back then, the Hubble’s capabilities when Voyager crossed the region, the spacecraft trajectories and their onboard optical imaging and navigation limitations. So, all in all, practical limitations meant that Voyager really could not have done the Kuiper Belt exploration mission New Horizons is now performing. 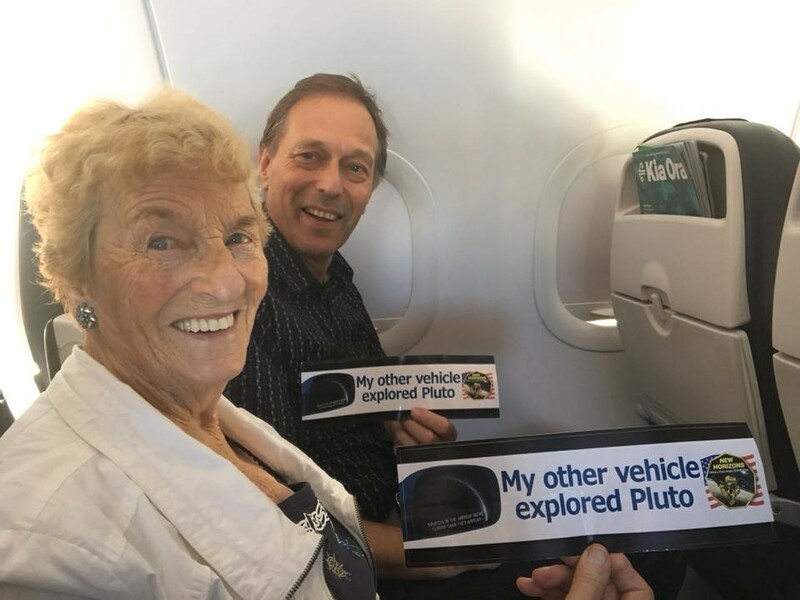 But no matter, New Horizons is exploring the Kuiper Belt, and the Voyagers left an amazing legacy of truly opening our eyes to the giant planets and their rings, satellites and magnetospheres—both amazing outcomes! I wonder when the next, even farther explorations will take place out in the Kuiper Belt, and how will people compare those future missions to what we accomplish with New Horizons? Well, that’s my update for now. For more mission news, stay tuned to the many websites and social media channels listed below. I’ll write again around the time we wake up New Horizons in early June. Until then, I hope you’ll keep on exploring—just as we do! Next Next post: The PI’s Perspective: Share the News—The Farthest Exploration of Worlds in History is Beginning!